And what better way to do this but with Forever flowers that are available all-year round? Life as an older person can be very solitary especially when all the children have grown and moved out of the house. This is very noticeable with elderly couples living together in various communities. Brighten their year with a nice arrangement of classy roses, tulips, or hydrangeas that are sure to brighten any room. Not only will this make your elderly neighbour/s feel appreciated, it will make them feel special as well. Giving back to the person who’s taking care of your child, house, pets, or anything that needs attention is always nice to do especially if you constantly seek for their help and services. It’s always nice to ask the person what specific flowers or colours they like. Everyone undergoes negative events and experiences throughout their lifetime. And among the closest people we know who we constantly hear about these situations are our friends. Help a friend in need by bonding over coffee or arranging a similar meetup. It’s also best if you can hand out a nice, artificial flower arrangement you got online that can remind them of your presence as well as your caring thoughts for them. Whether your kind coworker is your friend or is simply a colleague, it’s always nice to let them know that they can air out any pressing concerns with you whether it’s of a personal or professional nature. And if they are undergoing such troubles, one way to let them know you’re looking out for them is to hand them a nice bouquet or arrangement of Forever Flowers that lets you say the words and the emotions you want to impart with them. They’re also quite good for celebrating accomplishment at work or happy events that are happening in their personal lives such as an engagement, a birthday, or an upcoming wedding. All achievements are always better when celebrated with a nice reward no matter how simple. Share in the joys of the other person’s successes by gifting them a vase or a bouquet of nice artificial flowers that will never wilt or will need as much attention as normal organic flowers do. They can use this to commemorate their success or even use it to decorate free spaces that need a little colour. 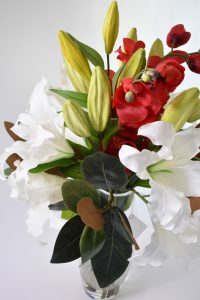 Some of the more popular flowers that spread the happiness of achievements are calla lillies and orchids. The hospital doesn’t always have to be a gloomy place. It can also be a place filled with high hopes, happiness, and acceptance. Whether you’re sharing a ward temporarily with someone or you’re visiting someone who’s been confined in a ward for a while, it’s always nice to give concern to the other patient/s in the room. You or the patient you’re visiting might have a few visitors, but sometimes others do not. Make them feel as loved as you or the patient you’re visiting is by gifting them a nice, colourful arrangement that can inspire them to rest better that can then lead to their fast recovery. Thinking of trying out artificial flower arrangements for your next event? Drop us a line below or call us at 0458 108 109 today for more information. For more artificial flower news, tips, and tricks, please subscribe to our newsletter for the latest blogs.